Today let’s discuss character design! This is a complex topic, and I can foresee several other blog posts to be done on this topic. What we call character design is often called “study”, because this is what it is: the “study” of a character. It is more than just a graphics style as you could do for a standalone artwork. And as such, it involves many attempts and experiments. With Aryeom, we have discussed and reviewed a lot Marmot’s design. This is the main character after all. So she did and redid him a few times. You may remember some of the early designs, which we posted exactly a year ago, and you will likely recognize the design we used in our teaser. These types of design sheet are called “turnaround” sheets, since they show the character on various angles, usually at least front, back and one side (or both sides if the character or one’s clothing are not really symmetric). Sometimes you may have more angles, or even specific sheets with smaller angle rotations, focusing on a particular side of the body (like a few angles on the back, etc.). 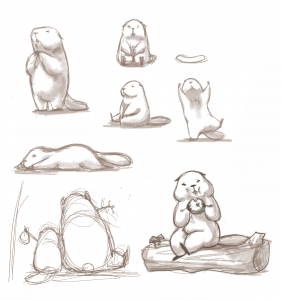 There were actually a lot other versions of Marmot, for instance one of the early conceptualization was very cute, and I still like it very much. As you can see, this is a different style of character sheet. You often find these under the name of “rough” character sheet since these are quick sketches (which is what a rough is) of the character in various poses or situations. These different kinds of character sheets are complementary and in the end, you have many of these for the same design. Rough ones are usually earlier in the concept design, though it may depend on the artist. So what are these for? They have multiple purposes. Of course a main goal is collaborative work: if several artists have to draw the same character, one has to make sure everyone doesn’t draw a personal variation. Consistency is important. But even if you were to work alone, you need consistency with yourself! With time, memory and your previous work as only reference, you lose the chosen style and the character attributes. You cannot even use your own scenes as reference because you would slowly diverge, from scene to scene. Indeed maybe the character in scene 30 looks like in scene 29. Same for scene 29 and 28. But what if you were making slight changes while barely noticing, or letting them slip since these may be seen as minor glitches, which would add up, so that the styles between scene 1 and scene 30 are actually quite different in a very noticeable way? This is why you need a stable reference fixed in time, always the same. So you prepare your reference for various cases, on all angles, and plan a whole bunch of possible poses and actions to refer to later. These references are the character sheets. Note that even (more?) 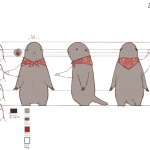 for 3D films, you need character sheets as a detailed reference for the 3D modeler. Finally another good purpose is to build a solid character. When you draw and redraw, you get to understand him/her, to grasp one’s purpose and behavior, one’s particular attribute. Why is he wearing this? How did one get this scar? Should one have a birthmark here? What kind of action is one likely to do? Is it a character who runs? Who cries often? Who is happy? Without this, you end up building up the character in the same time as you produce the film, and create irregularities, or changes which don’t add up. How many times have I read webcomics where a character would be right handed or left handed on different scenes, or attributes as important as scars would be forgotten sometimes. Why? Likely because these attributes had no real meaning for the creator (of course mistakes happen to anyone, with or without character design. This is not a perfect fail-safe tool. But it helps). Once again, this is about consistency, but also about a deep character that people will love or hate, and in any case in who they will believe in. Note also that this is all just “common knowledge”, and there are “styles” where detailed character sheets (or even character sheets at all) might not be necessary, or — why not — even undesirable (that would be rare though, but why not!). Rules are here to be broken, as long as you do it on purpose while knowing what it entails. In the end, use your common sense. Something we heard a few times with our teaser was: «this cat is so cute!». Now we don’t want to do a scientific documentary, but we still want that people recognize which animal we are drawing (ok it wasn’t that bad. Many people still directly recognized a marmot; also it turns out that in many countries, marmots are quite an unknown animal, which explains failure to recognize). 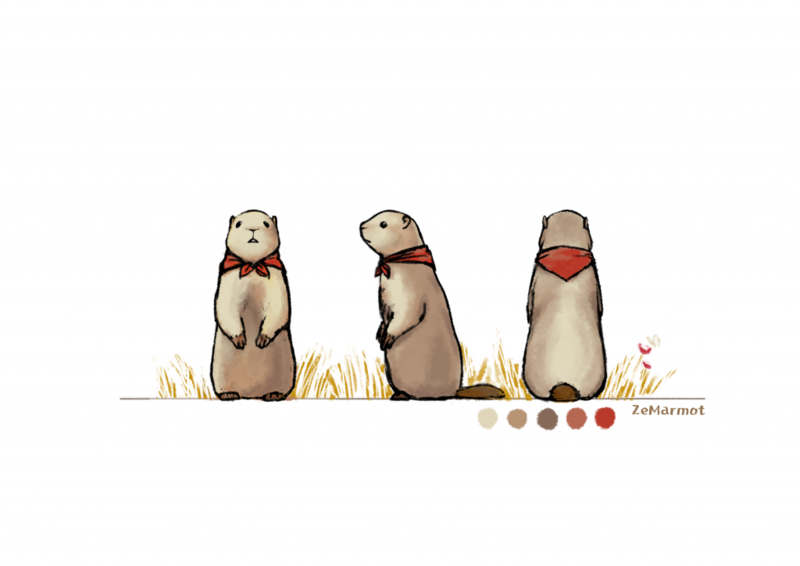 On the other hand, we don’t want too much of anthropomorphism in our movie, but this is still an animation about a marmot traveling with a swag on the shoulder, so there is a good share of anthropomorphism anyway, right? So this makes it OK to leave some scientific aberration for the purpose of a fun movie. Let’s just make a good compromise between scientific rigor and fun. To cut to the chase, here is the current design for our main character. Note that we still allow ourselves to change the design before actual production (i.e. finale drawing) begins, but we thought it may be worth updating you with this new design. which you may already have noticed in our new year drawing. What to say about it? First it obviously looks a lot more like a marmot while still keeping its share of anthropomorphism. 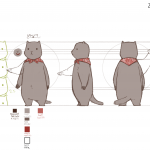 In particular the feet look shorter than most our other designs, the snout is closer to the real deal, eyes are on the side rather than in the front, and the ears are lower than the teaser version (ears in particular were probably the attribute which made people believe it was a cat). Fingers also properly follow marmot’s anatomy with 4 fingers on the arms and 5 on the feet. The color scheme has also been updated, brighter, brownish. 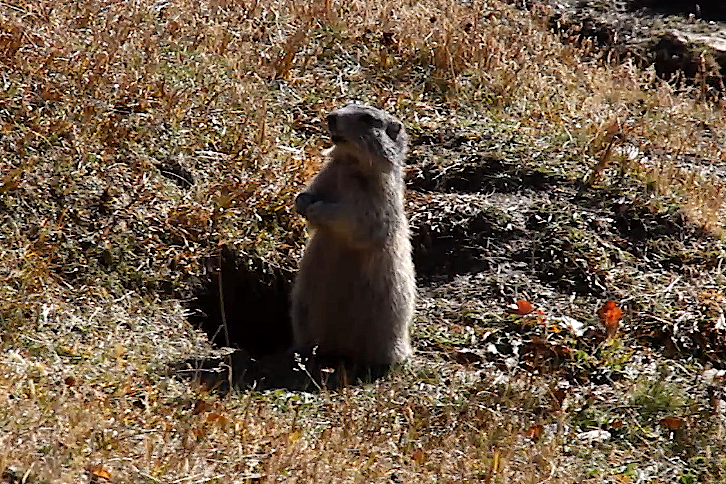 The grey color was making it too close to a mouse (even though many marmots are really grey-ish). On this topic, you can notice how Aryeom places the character color palette directly on the design to easily pick from it later (because a colorized character sheet would not only be about painting consistency but also color consistency). I think this is all for now. Soon more on character design and other topics! works by Aryeom,under Creative Commons by-sa 4.0 international. Thank you for this post I think it is very helpful. We will do more of these posts to share more on our creation process.